Happy birthday Isabella Leitner (The Big Lie), Lynn Johnston (Farley Follows His Nose), and Debby Atwell (Barn). In 1859, sixteen horses pull a carriage carrying Big Ben from the Whitechapel Bell Foundry to the Palace of Westminster. Read B is For Big Ben: An England Alphabet by Pamela Edwards, illustrated by Melanie Rose, and Ben and the Big Balloon by Sue Graves and Helen Jackson. San Francisco’s Golden Gate Bridge officially opens in 1937. Read Pop’s Bridge by Eve Bunting, illustrated by C. F. Payne. It’s International Jazz Day, which takes place yearly on the Saturday of Memorial Day weekend. Read Jazz by Walter Dean Meyers, illustrated by Christopher Myers. Today marks the 103rd birthday of British writer, journalist, and Naval Intelligence Officer, Ian Fleming. If his name sounds unfamiliar, you’re sure to know the character he created “Bond. James Bond,” who has become part of our cultural landscape, just like Sherlock Holmes. Like other authors who first distinguished themselves writing for adults – E. B. White or Esther Forbes—Fleming created a children’s book, Chitty Chitty Bang Bang: The Magical Car, based on a story he told to his son. Published in 1964, the year Fleming died, the book brought a fantasy car to life, one that any child would love to own. This once-beautiful automobile had become a pile of junk, ready to be towed off and destroyed. Fortunately, Commander Caractacus Potts, an inventor, sees possibility in this machine. He lovingly restores her in secret, in his garage. When the commander, his wife Mimsie, and their two children, Jeremy and Jemima, finally take her out for a spin, they name her “Chitty Chitty Bang Bang” because of the sound she makes. Only later, on a vacation day to the beach, do they discover that she can sprout wings and fly, turn into a motor boat, and hone in on a gangster getaway car. She even exhibits independent actions and thinking. Lights appear on her dashboard that provide instructions—simple statements such as “PULL IDIOT.” In the end, Chitty Chitty Bang Bang foils some gangsters’ plan to rob a French candy store, and then heads off into the stratosphere with the Potts family along for the ride. May has been designated Get Caught Reading Month by the American Association of Publishers. During this month various celebrities—L. L. Cool J, Johnny Damon, Clifford the Big Red Dog—pose for posters that show them reading a book. I have no doubt that James Bond himself would be caught reading Chitty Chitty Bang Bang. It is just the type of story that any spy in training would want to pick up. Happy birthday Ian Fleming; thank you for reminding us just how much fun and excitement can be found in the pages of a book. And no one—not one of the dozing family—noticed that the wheels of CHITTY-CHITTY-BANG-BANG were slowly, inch by inch, being submerged by the incoming tide, and no one realized that soon, very soon, the whole family, Commander Potts, Mimsie, Jeremy, and Jemima—and CHITTY-CHITTY-BANG-BANG, who by now was really a member of the family, too—would be marooned out in the middle of the sea—threatened with mortal danger!!! Originally posted May 28, 2011. Updated for . 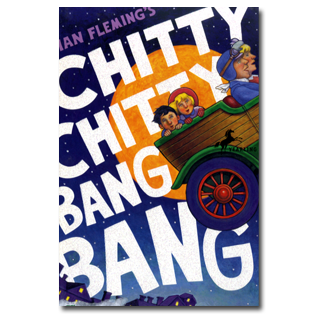 I’ve just heard that British author Frank Boyce (“Millions”, “Cosmic”) has been asked by the Fleming family to do a modern version/sequel to Chitty Chitty Bang Bang… very curious, could actually be quite fun! There’s something so contemporary and fun about a flying car — and in this adventure the parents aren’t even left behind. The kids manage to have great adventure with the parents onboard! While I have seen the movie many times (it was my house mate’s favorite movie the year I was in library school) I have never read the book. Sounds like a perfect mental getaway for a weekend such as this. Interesting how the mother is alive in the book…I’m always intrigued at how movies get translated from books. Jory: You are right. The title at this point is now Chitty, Chitty Bang Bang Flies Again by Frank Boyce, on the Candlewick List for Spring 2012. You are definitely on top of new developments! I think anything Frank Cotrell Boyce writes is brilliant. Should be a great sequel. I’ll need to read the first!